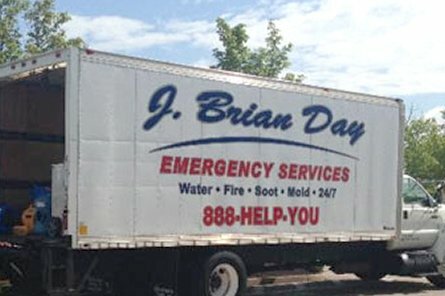 At J. Brian Day, we not only serve homeowners and commercial businesses, but educational institutions as well. This past weekend, an emergency situation arose at a local college in nearby Norton, MA. A sprinkler in one of the college’s dormitories broke, causing massive flooding in the hallways. As the photos below indicate, the water from the sprinkler even made its way into some of the students’ rooms. At approximately 10 p.m., we received the call and J. Brian Day was on the way. Our water damage crews worked as quickly as possible to remove the water from the dormitory. Since the situation occurred late in the evening when some students were trying to sleep, it was very important that we resolve the emergency ASAP. Water damage emergencies such as this one can be extremely disruptive and stressful. Kudos to Mark Andrade and his restoration crew for working hard to help the college and dormitory resume a sense of normalcy in a very short period of time. Given the unexpected nature of water damage emergencies, it’s important to know who to call in the event of such as crisis. Whether you are a homeowner, businesses owner, or higher learning institution in the Norton, MA area, we can help you mitigate and restore damage caused by a water leak. We’re available 24/7 and will work tirelessly until the situation is resolved. In the event of a water damage emergency, please give us a call at 888-HELP-YOU!